Brand new for 2016 is the Cannondale CaadX Ultegra, taking the place of the SRAM Rival from last year. This capable cyclocross race bike is versatile so you can race at the weekend and commute in the week. Ideal for racing, commuting, Winter training and general rough road riding it’s no wonder the CaadX is so popular. 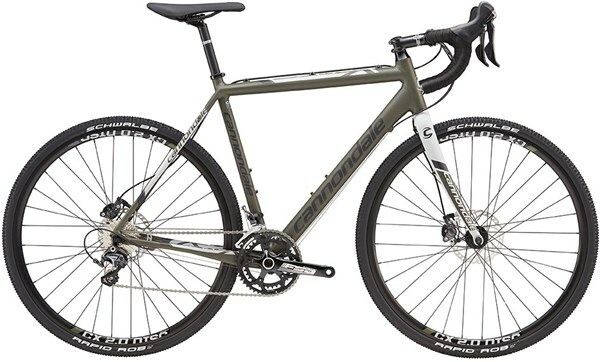 You can buy the Cannondale CaadX Ultegra through a 0% interest Tredz Finance package. At the heart of the CaadX is a light, stiff and strong 6061 aluminium alloy frame for all round race performance. When compared to its CX specific brother, the Super X, the CaadX has a more relaxed geometry. A slightly taller head tube gives you a more upright and comfortable riding position. A slacker head angle improves handling. Save Stays (seat and chainstays) have a flattened profile and are engineered with refined butting. This provides vertical compliance whilst maintaining lateral rigidity for efficient power transfer and confident handling. A Cannondale signature classic, Smooth Welds, are in attendance. A double pass smooth weld technique is used to eliminate weak points that are found on traditional welds. Taper butted tubes help to create a lighter and stronger frame. Removing excess material from low stress areas in the tubes lowers overall weight. Smooth transitions provided by taper butting reduces internal stresses more than traditional butting. The CaadX also comes with a BB30 bottom bracket which is super stiff to help with power transfer through the pedals. 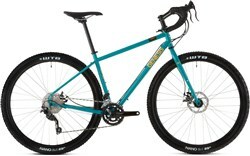 Rack and fender mounts show the cyclocross as a capable commuter and year round riding machine. Up-front you get a carbon bladed fork which is able to absorb road vibrations from travelling up through the handlebar. It also increases steering precision. You get a 2x11 speed Shimano Ultegra drivetrain. Ultegra is just one step down from the pro level Dura Ace and is itself a performance setup. Super crisp shifting, reliability and feel help you get the most out of your riding. Shimano hydraulic disc brakes are powerful and work equally well in all weather and terrain conditions. This opens up the CaadX Ultegra as an urban commuter and year round machine. Hydraulics have better modulation and long term reliability than their mechanical counterparts. Showing its cyclocross credentials, the CaadX 105 comes with an FSA Gossamer Cross crankset made to work with the super stiff BB30. Maddux CX rims on Formula CX hubs are also cyclocross specific components for hard racing. Fork: Cannondale Ultra X Disc, Carbon blades, 1-1/8"